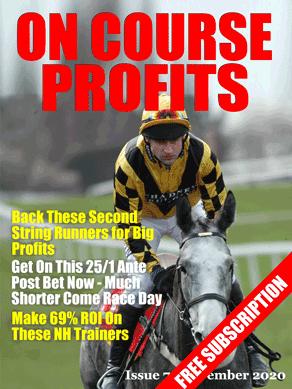 Today we have a freebie for you that will hopefully make some serious profit this National Hunt season. It comes from a guy called Ben Aitken that you have probably heard of. Ben takes an alternative approach to winner finding, the main difference is that he uses the Dosage Index to analyse National Hunt runners. The Dosage Index is a mathematical figure used by breeders of Thoroughbred race horses, and sometimes by bettors handicapping horse races, to quantify a horse's ability, or inability, to negotiate the various distances at which horse races are run. It is calculated based on an analysis of the horse's pedigree. The Dosage Index is commonly used to assess horses running on the flat, but Ben is the only person I know that also uses it for National Hunt racing. The upshot of that alternative approach is that he finds a lot of big priced winners. But back to the freebies. Ben is currently giving away a number of FREE racing guides, the most interesting for me is his ‘20 To Follow’ for the season. Now this isn’t your standard list. Why? Because Ben has deliberately left out any Mullins, Henderson and Nicholls horses! Indeed there are no Hobbs, McCain or King horses on the list either! That instantly makes the list of interest for me. What’s more he has also managed to secure some exclusive trainer quotes for a couple of the horses on his list, adding even more value to this excellent FREE guide.